A trip to one or more U.S. national parks is a top bucket list item for many folks. And although most of the parks have rugged back country areas, the majority have also made access upgrades so that wheelchair-users and slow walkers can enjoy these national treasures. As an added bonus, admission discounts are available to seniors and people with a permanent disability. That said, advance planning greatly enhances any national park visit; so with that in mind, here are some tips and tricks to help save time, money, and avoid disappointment on your next national park adventure. If you’d like to save a few bucks on your next national park visit, then pick up one of these discount passes at any national park entrance station. They all provide free admission to the passholder and all passengers in the same vehicle, but they each have different eligibility criteria. The Access Pass is available to U.S. citizens or residents with a permanent disability. Proof of disability is required in order to obtain this free lifetime pass. It’s also available by mail for a small handling charge. The Military Pass is available to all active duty and reserve military personnel. There’s no charge for this yearly pass, but a Common Access Card or Military ID (Form 1173) is required to obtain one. The Military Pass is not available by mail. The Senior Pass is available to U.S. citizens or permanent residents who are at least 62 years old. This lifetime pass costs $80. An annual Senior Pass is also available for $20, and the cost of that annual pass can be applied to the purchase of a lifetime pass. Proof of age and residency or citizenship are required to obtain either pass. These passes are also available by mail for an additional handling charge. The Annual Pass is available to anyone and it’s a good choice if you plan to visit many national parks. The pass costs $80 and it’s valid for a year. An annual pass for each individual park is also available, and the price for these passes varies depending on the park. 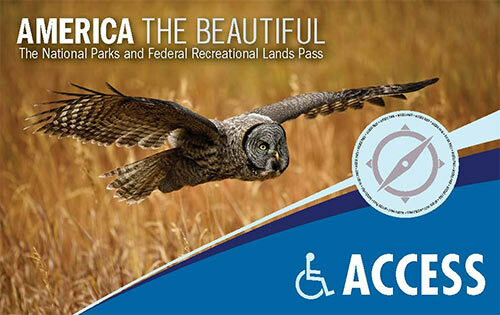 This pass is an attractive choice for folks who live near a national park and plan numerous visits. Both passes are available though the mail for an additional handling charge. Finally, the free Annual 4th Grade Pass is available to all 4th graders. It’s valid for the duration of the 4th grade school year and the following summer. Paper vouchers can be obtained at www.everykidinapark.gov and exchanged for an Annual 4th Grade Pass at any national park entrance. This pass is also available to home-schooled students. For more information about these passes, visit store.usgs.gov. Even if you don’t have a park pass, you can still get free admission on one of the five “fee free days” each year. During these days, the park gates swing open and no entrance fees are collected. Unfortunately the parks get pretty crowded on those days. Here’s a list of the fee-free days, but it’s best to visit www.nps.gov for the exact dates, as some do change slightly every year. Timing is everything, when it comes to a national park visit. Generally speaking, most parks experience peak visitation between Memorial Day and Labor Day. Unfortunately many parks also have abbreviated seasons, so it’s difficult to visit outside of prime time. If you must visit during the high season, try to avoid summer weekends and holidays, as parking, lodging and campsites are difficult — if not impossible — to find at those times. Additionally, an early morning visit will help circumvent the crowds. The magic hour is usually 10 AM, after which the bus tours start to roll in to the parks. Some parks —like Arches National Park – even close their gates if they get too crowded. In fact, during peak season, it’s not unusual for traffic to back up all the way from the Arches entrance station to Highway 191 in the late mornings. When that happens rangers have to temporarily close the gates as a safety precaution. It’s also not unusual to wait an hour in the entrance queue at the more popular national parks, if you arrive in the afternoon during peak season. On the other hand, if you get an early start, you’ll have a more relaxing visit, and you won’t have to fight the crowds. The best way to have a more enjoyable experience is to plan for several morning national park visits instead of a day-long excursion. Although many parks are open year-round, some experience seasonal road closures. For example, Going-to-the-Sun Road, which traverses Glacier National Park, is closed from late fall to late spring due to heavy snow. Sections of the road open incrementally, and the entire length is not passable until June or July. Likewise, Tioga Road in Yosemite National Park is usually closed from November to May, and the park is inaccessible from the Tioga Pass Entrance at that time. Some parks may also experience temporary road closures due to extreme weather conditions. It’s not unusual for Yosemite to close some roads during heavy snow; and the park has closed entirely a few times during heavy floods. 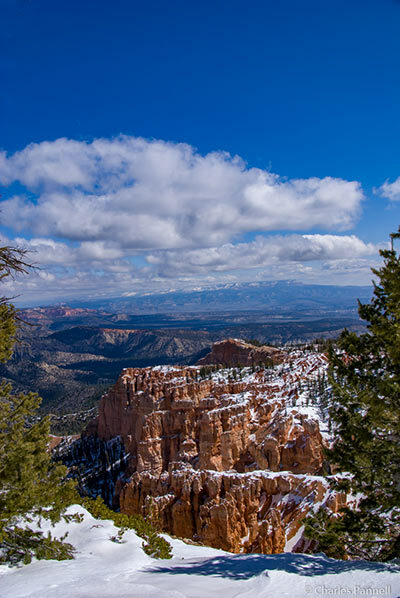 And although Bryce Canyon National Park is open year-round, there may be temporary road closures after snow storms, until the roads are cleared. It’s a good idea to always carry chains or cables when traveling through the western national parks, as spring and fall snow storms are not uncommon. Most parks also have a weather and road condition telephone number posted on their website; however it’s also a good idea to monitor the park’s twitter and Facebook feeds for breaking news about road closures. It’s a good idea to take note of the elevation of the places you plan to visit in the national parks, especially in the Western U.S. Although the symptoms of altitude sickness generally do not appear at elevations under 8,000 feet, wheelchair-users, slow walkers and people with compromised immune systems may feel the effects of increased altitudes at significantly lower elevations. Symptoms can include headaches, dizziness, shortness of breath, lethargy, insomnia and gastrointestinal disturbances. If you are unfamiliar with the effects that higher elevations have on your body, it’s best to take it slow and drink plenty of water for the first few days at any increased elevation, especially if you live at sea level. Additionally, you may want to consult your doctor regarding the effects that increased elevations may have on your specific condition. Many national park visitor centers have free loaner wheelchairs for visitors who can’t walk for or who tire easily. In most cases the loaner wheelchairs cannot be taken to other areas of the park. Additionally, they are available on a first-come basis, so if you absolutely need an assistive device to get around, it’s best to bring one with you. Some parks go a step or two beyond providing a standard wheelchair. For example, Redwood National Park has beach wheelchairs available at many location and Great San Dunes National Park has a sand wheelchair available. Additionally, Yosemite National Park has a handcycle rental concession, so everyone can explore the 12 miles of paved bicycle trails that wind through the park. There are some restrictions on pets in many national parks; however service animals — as defined in the Americans with Disabilities Act (ADA) — are permitted in all areas of the parks, including public buildings, lodges and shuttle buses. Under the ADA, a service animal is defined as a dog that is individually trained to do work or preform a task for a disabled person. Furthermore, the work or task that the dog provides must be directly related to the person’s disability. Dogs whose sole function is to provide comfort or emotional support — Emotional Support Animals — do not qualify as service animals under the ADA. Emotional Support Animals are subject to the park’s pet regulations and restrictions. It should also be noted that although some organizations sell “service animal registration” documents on-line, these documents do not convey any rights under the ADA, and the Department of Justice does not recognize them as proof that a dog is a service animal. For more information on the ADA definition of a service animal, visit www.ada.gov/. Many national parks have hotels or lodges; and although most of the properties are historic, access upgrades have been added over the years. 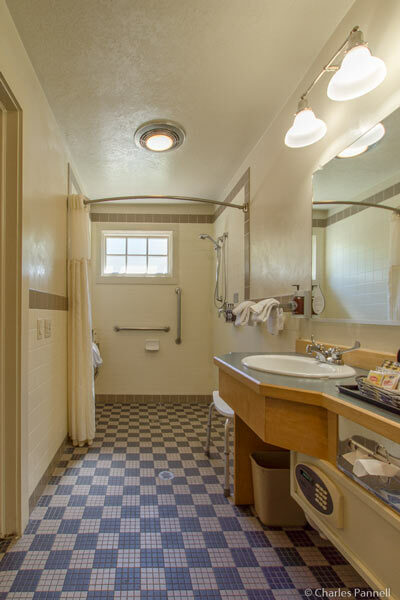 As a result many offer updated wheelchair-accessible rooms with roll-in showers. All of the in-park lodgings are managed by authorized concessionaires, who have contracted with the National Park Service, and operate under strict guidelines. They are responsible for the daily operations of the facilities, as well as improvements and upgrades. It’s important to deal with these concessionaires directly when you make a reservation; as not only will you get the best price there, but you will also have access to employees who can block the accessible rooms and describe the access details of each available unit. Unfortunately these concessionaires do not always come up first in internet searches because paid advertisements appear before them. Some of these paid advertisements even list “national park lodges” that are located many miles outside the parks, which is misleading to people who are unfamiliar with the geography of the parks. The authorized concessionaires for all the national park lodges are listed below, so look for their branding on any booking engine for national park properties. To avoid disappointment deal directly with these concessionaires for all national park lodging reservations. 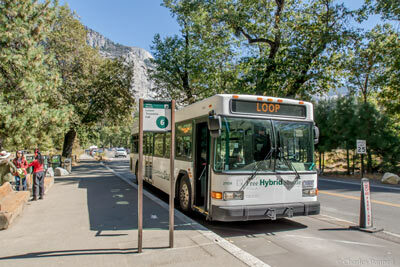 Some of the busier national parks offer shuttle bus transportation within the parks, to cut down on traffic. And although they are not mandatory, it’s a good idea to make use of them when they are offered, as parking is at a premium during peak season in the more popular national parks. Grand Canyon National Park, Yosemite National Park, Sequoia National Park, Bryce Canyon National Park, Denali National Park and Zion National Park all have accessible shuttle buses. And although most of the shuttles are optional the Zion shuttle is mandatory, north of Canyon Junction from March to October. Zion Lodge guests are given special passes at the entrance station that allow them to drive to the lodge parking lot. Some parks — such as Yosemite and Grand Canyon — also allow disabled visitors to drive on roads that are normally closed to vehicles. Yosemite visitors who have a disable placard can drive on Happy Isles Road and Mirror Lake Road; while Grand Canyon visitors who have a mobility issue can get a Scenic Drive Accessibility Permit, that allows them to drive on Yaki Point Road and Hermit Road when it’s closed to private vehicles. A disabled placard is not required in order to obtain this permit; however vehicles are prohibited from parking in accessible parking places in the park without a disabled placard or license plate. The permit is available at the visitors centers and park hotels. Some communities also offer shuttle transportation from gateway cities to the national parks. Groome Transportation (groometransportation.com/flagstaff/) provides accessible transfers between the Flagstaff Amtrak Station and Maswik Lodge on the South Rim. Accessible vehicles are available but they must be requested at least 24 hours in advance. And over in California, YARTS (www.yarts.com) provides fixed route public transportation to Yosemite from the surrounding gateway communities. There are four YARTS routes, which enter the park through each of the main park entrances. All YARTS buses are wheelchair-accessible; however passengers must contact YARTS at least 48 hours in advance insure availability. Most national parks have accessible campsites that are operated by the National Park Service or private concessionaires. 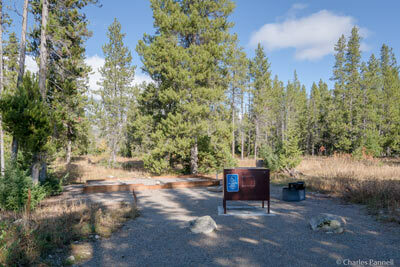 These sites usually include a paved parking space, a level tent site, a raised grill and an accessible picnic table. They are located near an accessible shower house which usually has a roll-in shower, an accessible toilet stall and a roll-under sink. Some accessible campsites also have raised tent platforms, which are built at wheelchair height for easier transfers. Grand Teton offers the raised tent platforms at Jenny Lake Campground and Signal Mountain Campground; while they are available in Yosemite at Upper Pines Campground, Lower Pines Campground and Wawona Campground. Some parks may require proof of disability in order to occupy an accessible campsite. If nobody has a need for an accessible site, able-bodied campers may be asked to move to a non-accessible site if a qualified person with a disability has a need for the accessible site. In most cases, accessible campsites may not be reserved by able-bodied campers unless they are the only sites left at the time of reservation. Reservation for accessible campsites may be made at www.recreation.gov or on the concessionaire’s website. 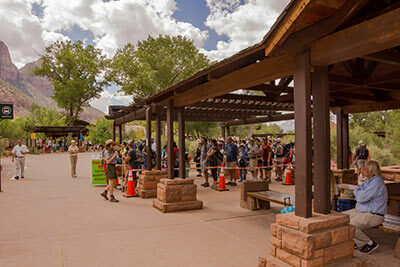 Free ranger-led programs are available throughout the day at most national parks. The programs include lectures about the local environment, guided hikes and evening campfire programs. Most of the lectures and campfire programs are wheelchair-accessible, but some of the ranger-led hikes take place on inaccessible trails. Consult the park newspaper or check at the visitor center for a current schedule and the accessibility details of the ranger-led programs. Some national parks also offer special ranger programs that require advance registration, For example, the excellent Ride with a Ranger accessible bus tour is offered twice a day in Zion National Park. There is no charge for the tour, but reservations must be made in person at the Zion Canyon Visitor Center. Seating is limited and reservations can be made up to three days in advance. And don’t forget about the Junior Ranger Program, which isn’t just for kids. Pick up a junior ranger field manual at the park visitor center, complete the activities and get a junior ranger badge upon completion. There’s no cost for the field manual or the badge, and some parks even throw in a cool extra treat, like the moose eraser I picked up at Isle Royale National Park. Even if you don’t go the full nine yards and get the official badges, you’ll still learn a lot about the national parks you visit by completing the activities in the junior ranger field manuals. Most national parks have at least one wheelchair-accessible trail; however that doesn’t mean it’s a completely level trail. According to ADA guidelines, accessible trails must be wide and on firm ground; and although most of the trail will most likely have a slope of less than 5%, a slope of 6% to 8% is allowed for 50 feet, a 9% to 10% slope is acceptable for 30 feet, and a slope of 11% to 14% is all right for 5 feet. On the plus side, many accessible trails also include signs that list their length, width, grade and cross slope. The most accessible trails are usually located near visitor centers. 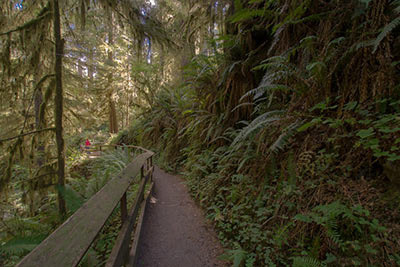 For example, up in North Cascades National Park, the extremely accessible .05-mile Sterling Munro Boardwalk starts in the back of the visitor center and winds through the forest out to a scenic viewpoint. This trail is wide and level, and doable by most people. Boardwalks are also popular around wet areas; in fact Yellowstone National Park has a number of accessible boardwalks near the park’s geothermal features. Midway Geyser Basin is a mile-long boardwalk that gains some elevation but the slope is gradual, and there are level spots to stop and rest along the way. There are wide level viewing spots along this trail that circles Excelsior Geyser, Turquoise Pool, Opal Pool and Grand Prismatic Spring – the largest hot spring in the park. It’s truly one of the nicest — and most colorful – geothermal areas in the park. Don’t overlook multiuse trails either, as many of them are wide, paved and wheelchair-accessible The Bryce Canyon Shared Use Path, which was christened in 2015, is an excellent example. The trail begins outside of the park at the shuttle staging area at Ruby’s in Bryce Canyon City, and travels 2.4 miles to the park entrance, then continues another 2.6 miles to Inspiration Point. And the good news is, the entire five-mile length is paved, level and wheelchair-accessible. It also connects with the shuttle system at the visitor center, general store, lodge, Sunset Point, Sunset Campground and Inspiration Point, so you can do as much of the trail as you like, then hop on the shuttle to return to your car. Many national parks also feature accessible trails to some of their top attractions. Such is the case in Yosemite National Park, which boasts the nicely accessible Lower Yosemite Fall Trail. 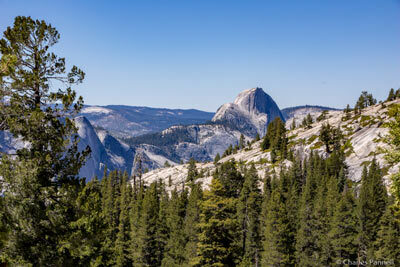 This wide paved half-mile trail leads through the forest to the base of Lower Yosemite Fall. A short boardwalk section of the trail also covers a muddy stretch, and has low bumpers for unobstructed wheelchair viewing. There are benches and interpretive plaques along the way, and it’s a pleasant spot to just sit back and enjoy Mother Nature. Plus you just can’t beat the feel of mist on your face as you admire the roaring falls. Although it’s entirely possible to see most national parks on your own, some concessionaires offer guided tours for a more in-depth experience. These accessible tours vary from park to park, but here are a few examples. In Grand Canyon National Park, Xanterra (www.grandcanyonlodges.com) offers a number of narrated bus tours that depart from Grand Canyon Village on the South Rim. Tour choices range from the Sunrise Tour that covers the west side or the park, the Hermits Rest Tour which travels along Hermit Road, the Desert View Drive Tour which focuses on sights in the east end of the park, and the Sunset Tour which concludes with a stop at one of the South Rim’s most panoramic viewpoints. Accessible buses are available for any of the tours with 48-hours advance notice, but it’s best to reserve space as far in advance as possible, as these popular tours fill up quickly. 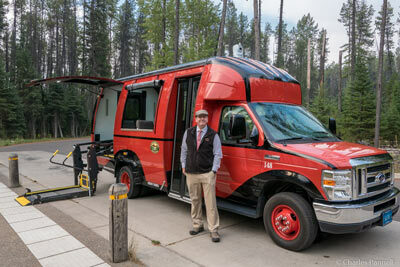 Over in Glacier National Park, Xanterra (www.glaciernationalparklodges.com) also offers a wheelchair-accessible alternative to the historic Red Bus Tours. These tours are conducted in luxury lift-equipped buses with two wheelchair spaces and tie-downs. Passengers get a full view of everything around them, thanks to an on-board camera and monitors, and roll-up plastic flaps on the windows. Tours are available on the west and east sides of the park, with stops at accessible trails and viewpoints along the way. And although these tours are a great option for wheelchair-users, they are available to slow walkers, people who use canes, or anyone who feels they can’t manage the two narrow 18-inch high steps and the bench seats on the historic vehicles. Even better, you get the entire bus to yourself, so it’s almost like a private tour. Last but not least, Aramark (www.travelyosemite.com) offers the incredibly scenic Valley Floor Tour in Yosemite National Park. This two-hour naturalist-led tour introduces visitors to the highlights of Yosemite, and presents a good primer on the natural history of the park. During good weather the tours are conducted in open-air trams which offer magnificent views of the surrounding natural features; but in inclement weather, buses replace the trams. Accessible tour vehicles for this popular tour should be requested at least 48 hours in advance, so book early to avoid disappointment. All of the parks have an official National Park Service page, which can be found at www.nps.gov. Although they contain maps and general information about each specific park, these pages are not updated daily. For updated information about road closures or other time sensitive information, it’s best to visit the Facebook page or follow the twitter feed of the national park in question. Many concessionaires also maintain a strong social media presence and are quite responsive to questions. Finally, for specific access tips and suggested itineraries on some of the nation’s more popular national parks, visit www.BarrierFreeNationalParks.com. Accessible Glacier National Park Sans Car — It is Possible! Volcanoes, Mud Pots and Steam Vents, Oh My! North Cascades National Park — It’s More Accessible Than You Think!